I make cards. I will try to post regularly. I sometimes sew. I like to write, read, draw, dance, and make cards. I like SO SO happy the inspiration to my blog name. 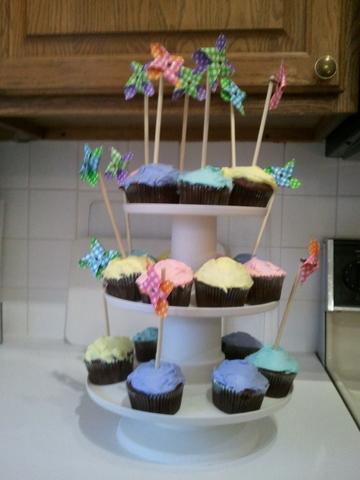 Easter cupcakes! Since Easter is coming up I decided to make these pastel colored cupcakes! I thought the windmills were a nice touch! I used frosting dye to dye them different colors. We got almost everything from Wal-Mart and the windmills, and wrappers from Michael's. The wrappers are floral but you can't really tell. and hip hop. I'm friendly so if I know you you're most likely my best friend because almost everyone I know is my best friend and there is nothing you can do to stop me. I do believe in God. I believe he is guiding me through my life. Trying to make me the best I can be. I'm obsessed with sparkles. Minecraft is my game!! I have one brother, two dogs, two cats, and one fish. My one fish is a widower because his wife Goldean died of bad water. May she rest in peace. I hope you liked it! Bye!!!!!!!!!!!!!!!!! We had a snow day today!! That is what inspired me to make this card. First I chose my pattern paper. I thought it was not as busy as the others and I didn't want to take the attention away from the snowman. Then I chose a dark blue card stock for the layer. 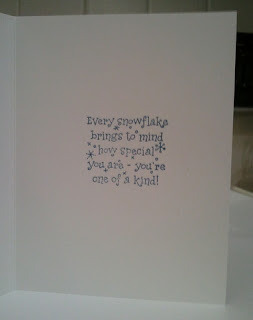 I thought it was nice because it accented the dark blue snowflakes. Then I chose my snowman. I wanted him to be tall and skinny because it would stand out from regular snowmen. 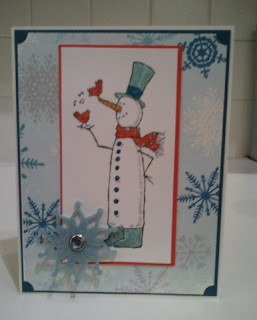 My mom's blog, The Stamping Tree, helped me cut the corners and make the rhinestone snowflake. 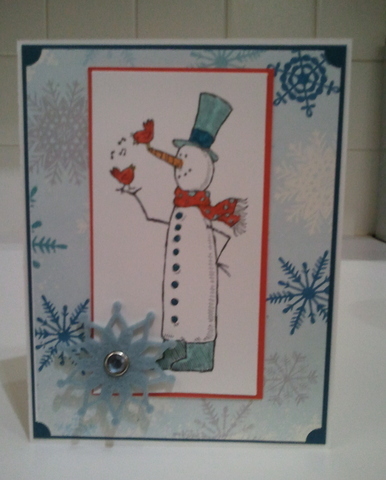 I colored the snowman and cut it to the right size and made the red layer. I hope you enjoyed my first post! Thank you for checking out my blog! Please leave a comment if you like what you saw. Please check out my mom's blog too!